Find hotel near National Science Centre F .. 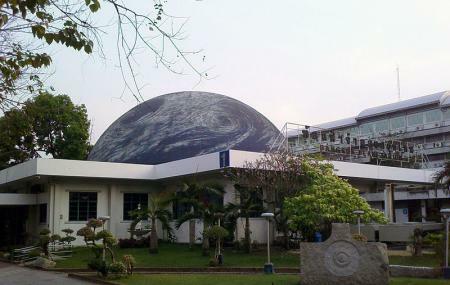 If you thought Bangkok was all about shopping, temples, street food, night markets and the adult stuff, the National Science Centre For Education (bangkok Planetarium) will prove you wrong. Considered as one of the best things to do in Bangkok with kids, this attraction hosts some lovely exhibits. You are in for some great stuff, further, if you or the kids understand Thai. This is a great place to sneak in some education in the form of entertainment even when you are on a holiday! Ease of accessibility by public transports sure draws a lot of visitors to this place. How popular is National Science Centre For Education? People normally also visit Ruamm Spa- Urban Spa Retreat Khaosan while planning their trip to National Science Centre For Education. It's actually good educational place especially for kids but all of the exhibitions are in Thai language. The planetarium show made us fall asleep due to the language narration, with nice dark and cold dome atmosphere. Entrance fee is cheap & clean toilet. Located by walking distance from nearest BTS station - Ekkamai. A very Interesting and Educating location, all about science physics. A good place for childhood memory & many exciting activities.